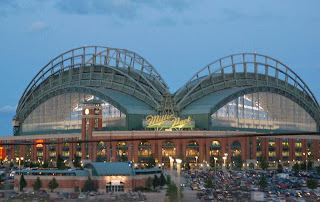 Ticket King Milwaukee Wisconsin: Ticket King Milwaukee Wants to Tailgate for Milwaukee Brewers Opening Day! Ticket King Milwaukee Wants to Tailgate for Milwaukee Brewers Opening Day! Can you believe that the Milwaukee Brewers Opening day is already less than a month away!! This year Opening Day lands on Monday April 5th and starts at 1:10pm. If you haven't requested off work yet or gotten your tickets, I suggest you do it fast! Ticket King's Milwaukee Brewers tickets are going fast! With only a few select great seats left in the field level. If your looking for a cheaper option just to get you in the door of the terrace level, we've got that for you too! I'm hoping for great weather this year too. Anything's better than last years weather though!